I haven't been posting my storytime lineups because I have been reusing themes I already did at my previous job, many of which I already posted on this blog. However, today was a brand-new theme for me: robots. 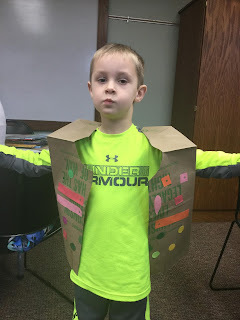 Craft: We made robot vests using paper grocery bags. Our local grocery store donated the bags, I had a volunteer cut out the head and arm holes, and the kids went to town decorating them. You may have noticed that my lineup style has changed quite a bit from when I was at my previous library. This is because my patron base is quite different. 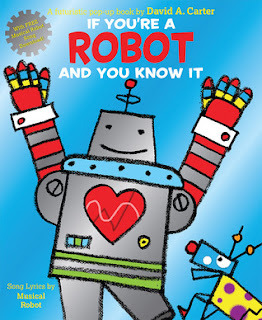 In my last library, storytime was attended by mostly K-2nd graders with some younger siblings. Here, storytime happens during the school day, so usually the oldest children are 4 and many are 2 or 3. I've reduced my books from five to three and added in more action rhymes and songs, because these things hold the kids' attention the best. We also repeat the rhymes and songs each week, so they don't always (or usually) match the theme. This consistency helps my young patrons to become used to the routine and learn the songs and rhymes so they can participate more fully in storytime.